The importance of managing occupational health and safety in an organization on a sound footing is recognized by all interested parties such as employers, employees, customers, suppliers, insurers, shareholders, contractors, regulatory agencies and the wider community. There is a necessity for an organization to control and improve its occupational health and safety (OH&S) performance. Every organization needs to have sound health and safety policies and show a strong commitment for the health and safety of its employees. This can be achieved by establishing and implementing an occupational health and safety management system (OHSMS) within the organization. OHSMS is a network of inter related elements. These elements include responsibilities, authorities, relationships, functions, activities, processes, practices, procedures, and resources. 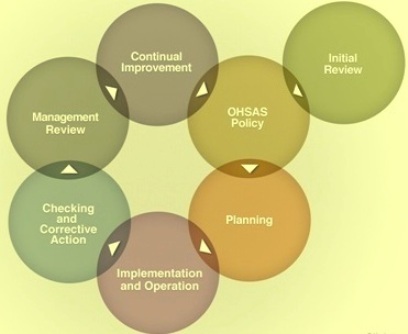 These elements are used to establish OH&S policies, plans, programs, and objectives. OHSMS is a systematic and process driven approach for controlling and monitoring OH&S risks that can arise from an organization’s day to day activities. OHSMS also addresses to those OH&S risks which may be there due to the changing statutory provisions. The system helps the organization to be proactive rather than reactive, therefore helping the organization to improve its OH&S performance more effectively while protecting the health and welfare of the employees on an ongoing basis. There are the three basic aspects of OHSMS in an organization that are given below. For an effective OHSMS, it is vital for an organization to handle these basic aspects with significance since these three basic aspects provide the important foundation for the successful implementation of OHSMS. Hazard identification – It is the process of recognizing that a hazard exists. A hazard is a source or situation that has potential to cause harm in terms of human injury or ill health. Risk assessment – It is the process of evaluating the risk arising from the hazard. The risk can be the combination of the likelihood of a hazardous event or exposure and the severity of the injury or ill health that can be caused by the event of exposure. Determination of applicable controls – These are the measures relevant to eliminate or to reduce risk to an acceptable level. Measures are based on the hierarchy of the controls. The framework of OHSMS is based on two main concepts of continual improvement and regulatory compliance. Different steps involved in OHSMS are shown in Fig 1. The most widely recognized and used standard in the world for OHSMS is OHSAS 18001. OHSAS 18001 is an Occupational Health and Safety assessment Series for health and safety management systems. It is intended to help an organization to control occupational health and safety risks. It was developed in response for a widespread demand for a recognized standard against which to be certified and assessed. The first edition of this standard was issued in 1999. The standard has been revised in 2007. Prior to 1999, there was a proliferation of national standards and proprietary certification schemes to choose from. This has caused a lot of confusion and undermined the credibility of each individual scheme. Recognizing this deficit, an international collaboration called The Occupational Health and Safety Advisory Services (OHSAS) Project Group was formed to create a single unified approach. The OHSAS project Group consisted of a consortium of 14 organizations for the 1999 edition and 43 organizations from 28 countries for the 2007 edition. The consortium includes a number of the world’s leading national standards bodies, registrars (certification bodies), consultants, and occupational health and safety institutes. British standards Institution (BSI Group), the national standard body of UK, provided the secretariat. The Series consisted of two specifications: 18001 provided requirements for an OHS management system and 18002 gave implementation guidelines. Establish an OHSMS to eliminate or minimize risk to employees and other interested parties who may be exposed to OH&S risks associated with its activities. Assure itself of its conformance with the stated OH&S policies. Demonstrate such conformance to others. Implement, maintain and continually improve an OHSMS. Make a self determination and declaration of conformance with the OHSAS 18001 specification. Seek certification/registration of its OHSMS by an external organization. The following are the basic requirements for OHSMS that are required to be fulfilled. Develop, document, implement, maintain and improve OHSMS. Define, document, implement, maintain and communicate the health and safety policy of the organization. Develop a methodology and establish procedures to identify hazards and to assess the organization risks. Implement and maintain hazard identification and risk assessment methods and procedures. Reduce OH&S risks by selecting appropriate controls. Establish procedures for the selection of the controls and implement and maintain these procedures. Establish procedures to identify and access all the applicable legal and non legal requirements. Keep all legal and non legal OH&S requirements upto date and communicate information about regulatory OH&S requirements to all the interested parties. Establish, develop and implement organization’s OH&S objectives. Also establish, develop, implement and maintain OH&S programs to achieve OH&S objectives. Top management must accept responsibility and demonstrate a commitment for OH&S. A member of the management is appointed to manage and control OH&S. It is to be ensured that the employees take responsibility of OH&S. Ensure the competence of people who perform tasks that could have an impact on employee’s health and safety and maintain records to provide evidence that these people are competent. Identify organization’s health and safety training needs and establish training methods and procedures. Provide training to meet the training needs. Evaluate overall effectiveness of the training activities and maintain records of training activities and results as objective evidence. Establish, implement and maintain procedure to make personnel aware of the safety. Establish procedures for OH&S communication. Establish, develop control, implement and maintain procedure for internal communication. Establish, develop, implement and maintain procedure for communication about employee’s safety with contractors and visitors. Establish, develop, implement and maintain procedure to control external communications. Establish, develop, implement and maintain procedure for employee’s participation in OH&S matters. This procedure should include consultation with employees and their involvement in the OH&S activities. Establish, develop, implement and maintain procedure for consultation, participation and involvement of contractors in OH&S activities. This procedure should also include consultation with external parties regarding OH&S matters. Documentation of OH&S policy, OH&S objectives, scope of OHSMS, elements of OHSMS and the interaction of the elements of OHSMS. All the documents and the records are to be controlled. Establish, develop, implement and maintain procedure for control of OH&S documents and OHSMS records. Identification of those operations and activities that should use controls to manage hazards and reduce risks and implementation of the required controls and operating criteria to manage hazards and to reduce risks. Implementation and maintenance of the documented procedures and controls to reduce risks. Establish, test, implement and review emergency management procedures. Establish, implement and maintain procedures for monitoring and measurement of OH&S performance. Record the results of monitoring and measurement activities for objective evidence. Establish, implement and maintain procedures for monitoring and measurement equipment. Evaluate compliance legal and non legal compliance. Establish a procedure each to periodically evaluate how well the organization complies with legal and non legal requirements. The results of the compliance evaluations are to be kept as records for objective evidence. Establish, implement and maintain procedures for investigation of the incidents and for taking of remedial measures. Establish, implement and maintain procedures for management of non conformity i.e. for identification of non conformity and taking of corrective and preventive actions. Establish and maintain OH&S records. Develop and implement procedures for record keeping and for controlling of the records. Establish, implement and maintain an internal OHSMS audit programme. Review OHSMS by examining the inputs. Assess the results of management reviews. Generate the outputs of management reviews and communicate them. OHSMS transforms the operation from detection mode to prevention mode. Prevention is less work and less expensive then detection. With OHSMS the organization mitigates or eliminates the hazards and the risks to protect the health and safety of employees. OHSMS creates consistency throughout the organization. It is built around ‘best practices’. OHSMS improves the performance of the organization. A well designed and well implemented OHSMS helps lessen workplace illness and injury. OHSMS reduces dependence on key individuals. It distributes responsibility and accountability across the employees. More people share more information and accountability for key tasks. OHSMS provides blueprint for controlled and disciplined growth. It shows a way for organizing and systematizing different practices for ensuring management accountability. OHSMS strengthens regulatory compliance since the employees become aware of laws and regulations that pertains to the organization working. It helps in filing of the statutory returns in time. OHSMS ensures consistent training of the employees. OHSMS improves management oversight since it incorporates monitoring and measurement of key performance indicators for providing objective data upon which the management decisions can be based. OHSMS helps in managing health and safety risks since it creates better working conditions with operational controls in place. OHSMS creates a corporate culture where employees are aware of their individual roles and responsibilities in looking after their own health and safety. Due to this culture employees are more likely to avoid potential hazards.